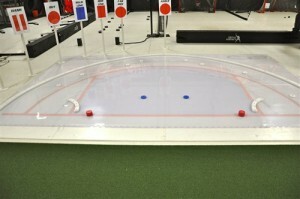 Check out this Slide Board Designed Specifically for Goalies! Every now and then I come across a hockey training product that just makes me go “wow!” That’s what happened when I first saw the X-Goalie Crease Slideboard from XHOCKEYPRODUCTS. Now, I’m admittedly NOT a goalie guy. But it’s not hard to tell when something is going to be beneficial for an athlete. 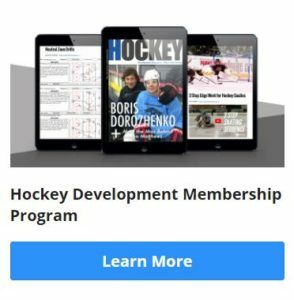 Watch the videos I’ve included in this post, and check out how closely this product allows the goalies to mimic their on-ice movements. Incredible! 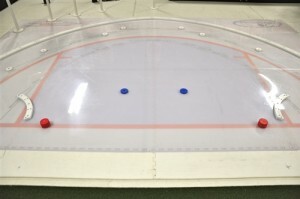 The X-Goalie Crease Slideboard features an NHL regulation goalie crease that utilizes Fan-tastic Sports technology along with the “ProHybrid Visual Lead Position System.” This system allows a goalie to develop muscle memory using the same Squareness, Angle and Depth as he uses on the ice. This crease uses adjustable stoppers to create customizable movement patterns. PowerStrides, Shuffles, Pushoffs, Recoveries, Slides and even paddle down wraps can be practiced on our board. This crease has two challenging levels: Foundation and Elite. Young goalies will want to start by using the crease at the Foundation Level. This level will allow them to get a feel for the system, and begin to build their leg strength and coordination. The Elite Level has stopper placements progressively further out as you approach the top angle. This level will challenge even the most established goaltenders due to the precision needed in angle adjustment, and the power it takes to carry the full distance outside the crease. All stoppers are located on the “Awareness to Squareness” lines. Each line gives the goalie/trainer immediate feedback as to whether or not Squareness has been achieved to a specific angle. In addition to the stoppers, the X-Goalie Crease Slideboard is equipped with a Recovery Bumper. This semi circle railing mirrors the crease line. It is used to execute a recovery or pushoff from your butterfly. The bumper is strategically placed in an ideal position relative to the stoppers for maximum load and power out of your hybrid setup. Moving in towards the posts you will find two blue net play stance stoppers. These stoppers are placed off of each post to ensure the goalies feet are 30 degrees off the goal line. This 30 degree angle gives the goalie a solid base while allowing him to see the strong side corner while keeping the weak side blue line angle in his or her peripheral vision. The goalie can lead the play with a quick shuffle, come back to the same post, lead again, then rotate and shuffle 30 degrees back to the opposite post. Lastly, this crease has paddle down wrap recovery bumpers in place. These arched rails enable the goalie to recover out of a paddle down wrap as if a player makes a pass instead of executing a wrap around. I don’t often wish I were a goalie… (No offense to any of you keepers who are reading this!) I love my position, and I play it well. However, this just looks like A LOT of fun to me, and I’m a little envious to tell you the truth! If you’re a goalie… you’ve gotta check this out.